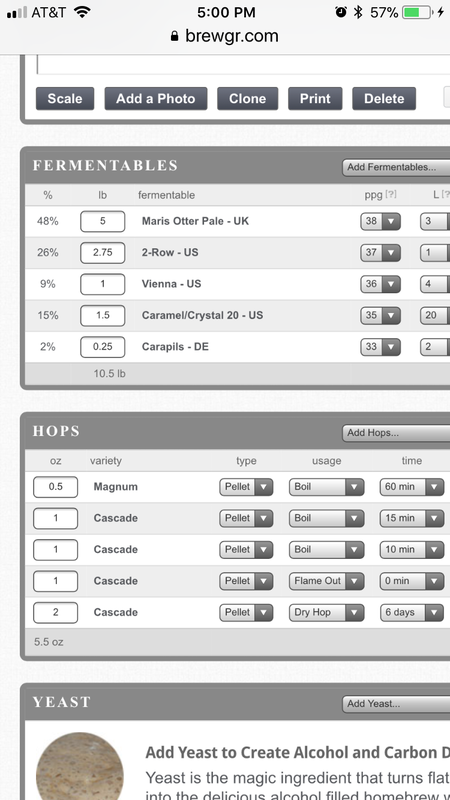 Bought a pound of Cascade pellets for $5 so decided we needed to make a cascade APA. Its nice smooth but seems kind of grassy and bland. Here’s the recipe, any thoughts? Dry hop is in the keg. Nope, that’s entirely reasonable. I usually go a bit heavier for a hop forward beer. My bigger concern would be the quality of hops you got for $5/lb. It was from the LHBS guy. A local grower gave him a bunch that he didn’t or couldn’t sell. They smelled really good but who knows? I’ve run into the exact same thing. Your recipe looks solid, a bit more crystal than I would use, but that’s personal preference. I think your hop pellets weren’t up to snuff, unfortunately. Put ‘em in our stainless hop bomb thingie, dropped it in the keg and racked the beer in on top. We put 30 psi on it and shook it till it quit taking and put it in the fridge. Drinkable but grassy. I’m hoping maybe a little time will help. I agree your hop schedule looks fine. Nothing about your process stands out as a culprit. I think the boys are right. You got some bad hops. Wet cones or hops that are stored in a moist warm environment can cause grassy flavors and sometimes even have mold on them. Could be something as simple as taking them from the fridge to a warm car or truck for transport if they weren't sealed airtight. Sounds like you kinew you were taking a gamble? Either way I'd let the LHBS know that he might not want to keep selling them. Not saying this happened to your hop pellets, but a local hop farm shut down recently. Unfortunately their product wasn’t very good - somewhere between the hop pelletizer and the nitrogen-flush packaging, their process broke down. End result, hops with decent aroma but badly oxidized. Grassy flavors in the final product. I would support local business any day, but sometimes the product just doesn’t make the cut. Thanks for the comments guys, as usual you’ve given me great info to ponder. Love how this hobby keeps me thinking!